This elegant guest/conference chair features upholstered arms, a contoured back, a solid hardwood frame, brass nail trim and brass capped dual wheel casters. 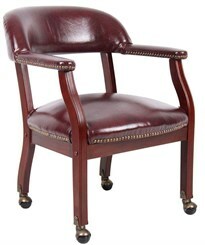 Antiqued vinyl upholstery and Mahogany frame. Measures 24"W x 26"D x 29"H overall. Seat height 19"H/arm height 24-1/2"H. Shpg. wt. 34 lbs. Easy assembly. PRICE INCLUDES FREIGHT! Please allow 1-2 weeks for delivery.